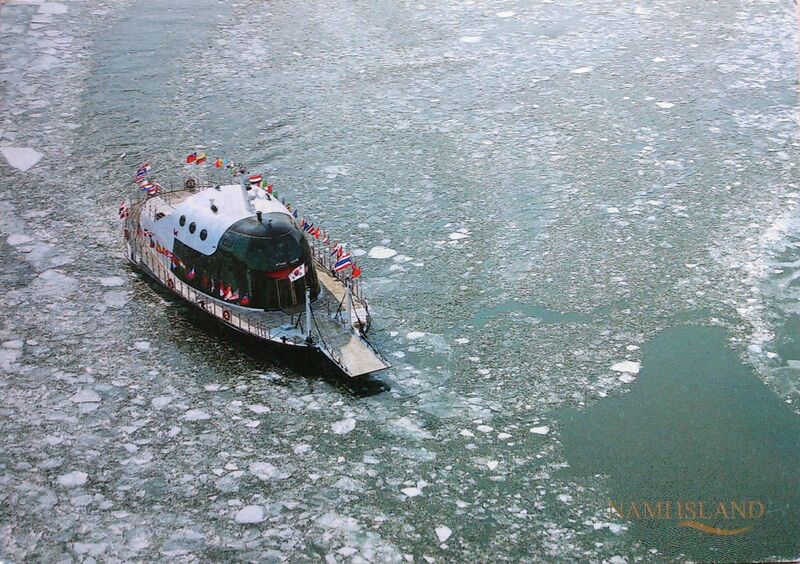 Namisum is a tiny half-moon shaped island located in Chuncheon, South Korea, formed as it was inundated by the rising water of the North Han River as the result of the construction of Cheongpyeong Dam in 1944. Its name originated from General Nami, who died at the age of 28 after being falsely accused of treason during the reign of King Sejo, the seventh king of the Joseon Dynasty of Korea. Although his grave wasn’t discovered, there were a pile of stones where his body was supposed to be buried. It was believed that if someone took even one stone from there, it would bring misfortune to their house. A tour company arranged the grave with soil and then developed Namisum into an amusement park. Namiseom Island is 63 km away from Seoul and is famous for its beautiful tree lined roads. A special feature of Namiseom Island is that there are no telephone poles. This is because all electric wires were built underground to keep the natural feeling of the landscape. 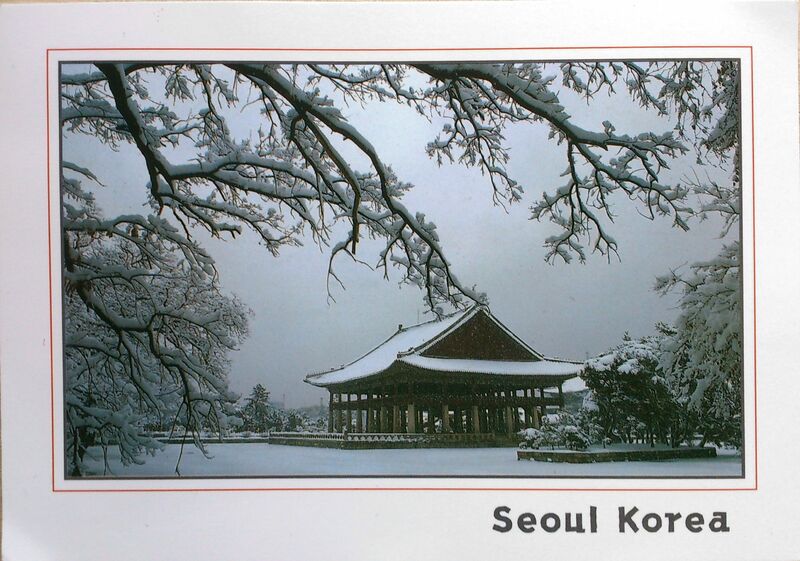 My very first postcard from South Korea comes from Yeongji. It pictures the Gyeonghoeru Pavilion, which is part of the Gyeongbokgung Palace. Gyeongbokgung Palace is a royal palace located in northern Seoul, South Korea. First constructed in 1395, later burned and abandoned for almost three centuries, and then reconstructed in 1867, it was the main and largest palace of the Five Grand Palaces built by the Joseon Dynasty. The name means “Palace” [Gung] “Greatly Blessed by Heaven” [Gyeongbok]. In the early 20th century, much of the palace was destroyed by Imperial Japan. Since then, the walled palace complex has been gradually restored back to its original form. As of 2009, roughly 40% of the original number of palace buildings still stand or have been reconstructed. Gyeonghoeru, also known as Gyeonghoeru Pavilion, is a hall used to hold important and special state banquets during the Joseon Dynasty. It is registered as Korea’s National Treasure No. 224 on January 8, 1985. The first Gyeonghoeru was constructed in 1412, but was burned down during the Japanese invasions of Korea in 1592. The present building was constructed in 1867 on an island of an artificial, rectangular lake that is 128 m wide and 113 m across.